chronicling my life. hoping to stay young forever. A random reflection that walking from place to place is like an intentional resistance to our modern culture of efficiency and desire for constant engagement. I realise that in recent years I tend to pack my day to fit in the various things. Which in itself is not evil, and yet too many of these kind of days actually hollows my (our) soul(s). We are not created to function on autopilot, but to feel and glorify God in all that we do. Today was the first Saturday in awhile that I had the whole day largely unplanned- just cousin's housewarming and then my parents and I had a deliciously free day full of things we could explore. We walked so much, and I really enjoyed that I didn't need to check the time to go off elsewhere. Just being present and enjoying the present. A ray of shalom I guess. And yet to remain in the tension- not yet. Was quite grieved when Mum flat outright refused to even look at the evangelistic booklet left at our door. I truly thank God for this in-between season as I look ahead toward the new chapter of my life even as I prepare my heart to leave. Abba, You really do have a sense of humour. I had this mindset to wrap things up and press the reset button like I did 4 years ago, but You showed me otherwise. 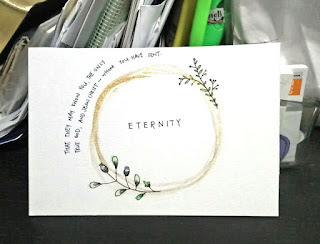 I asked for an end in my subconscious when faced with such brokenness and evil at work- seemingly more in recent months as I prepare to leave. My heart sighs and breaks at relationships not reconciled, children in lack, and youths seeking intimacy and significance in broken ways. Grief is uncomfortable. And You remind me that I have a calling as a prophet- to see, to grief, and then point to hope (Brueggemann, 2014). I was readying myself for farewells and the inevitable (?) drifting of friendships- yet I'd grown deeper in friendships with young ones and those already in my life. Used to think that I'm not really a people person; but I guess 2019 is showing me otherwise. Uber thankful for this Sabbath where I intentionally went offline though it is tough. 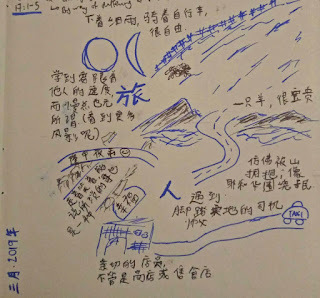 So much that God deposited in me through talking to Him, 赞美之泉, reading, and now writing. Today was a beautiful day in church- warm shalom greetings after service (I chose to sit at the pews though my default is at the side), having kids so engaged as I read this lovely book of prayers, Bible study on Jesus' position on the Sabbath with the girls (I think friendship with Ju is at another level through doing this together), and fellowship with CG peeps. Pure gold moments :') Where I genuinely feel God's presence in the moment as I share and receive from others. Those verses came to mind as I was praying for Mongolia, which led me to pray for the different ethnos as well. 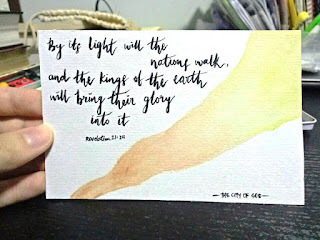 And I was suddenly filled with that deep longing and a deep sense of vision, as I envisioned awesome sights of each unique ethnos bringing gifts that reflect their culture and God's glory into the city of God. I think this is the source of my attraction to tribes and cultures different from my own. That first encounter with Mongolia awakened that sometimes troubling attraction. Is it just wanderlust and the desire to be 'free', or romanticised attraction? It's the third day knowing that I have been accepted into the PhD programme (i.e. I'm getting a bit nervous about having to make a clear decision soon). 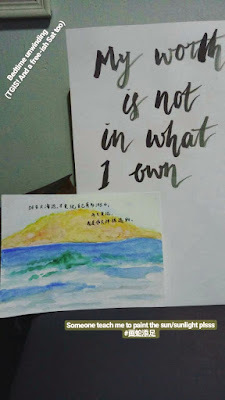 I thank God for watercolour; I usually lapse into thinking about God as an impersonal Being, but painting creation- the sky, mountains, seas, vast expanses- helps me to remember again that God knows the whole of me and I know Him too. It is really amazing looking at this because I'd initially wanted to paint a horse, but screwed up so I had to paint something over it. A tent because I'd just read about Jesus at the Feast of Tabernacles, and also Mongolians use gers. Later on, next to 奶奶 and thinking about going away, Psalm 90 came to mind. And so this watercolour took on a whole different meaning for me. Started off 2019 sick (from the 2 back-to-back camps in the last week of 2018), and unsure of where I'm heading in life for the new year. Of course, one can say that years, weeks and months are human constructs. I believe God has given us the gift of different seasons so that we can be refreshed and renewed- in vision and direction. This can be seen in nature anyway. I sense this year is going to have quite a bit of sacrifices- was that why God spoke much more clearly?- and yet, there is excitement and anticipation in this apprehension.